A year ago the Valley East Ladies' Slo-Pitch League was facing a serious enrolment problem. With only six teams registered just prior to the start of the season, the women who enjoyed playing this sport were worried. The season began with seven teams, but it was obvious that changes had to be made. The incoming executive knew they had a tough challenge, but they made it through the 2005 season and worked hard to get ready for the summer of 2006. Three of the Executive members met recently with Robert Kirwan, Publisher of Valley East Today to discuss plans for marketing and promotion of the league. Shown with Robert are, from the left, Robin Trottier, Secretary; Mandy Hnatiuk, President, and Natalie Raymond-Marois, Vice-President. Two other executive members were unable to attend the meeting. They are Nicki Trottier, Treasurer, and Paula Martel-Lavallee, Statistician. This year there are a total of ten (10) teams in the league, thanks in part to a decision by the League to drop the 'residency' restriction and allow teams and players from other municipalities. Two teams have joined with players who live in Rayside Balfour or Sudbury. Another positive change was the decision to allow girls who are 16 years of age and over. There are only a few younger players in the league, but at least they now have a place where they can enjoy this sport while in their late teens. As a result, there are over 200 women of all ages playing slo-pitch two nights a week during the 15 week season. They play at Centennial Ball Park every Monday and Wednesday evening, with games at 6:30, 8:00, and 9:30 p.m. It is a relatively inexpensive form of recreation for the ladies, with registration working out to approximately $100 per player. Each person provides her own equipment such as gloves, shoes, etc., and many even have their own personal bats. Mandy, Natalie, and Robin showed a great deal of optimism for the league during the league and much of the discussion turned to long-term goals for upcoming seasons. All three are around the age of 30 and it is obvious that they intend to work hard to build up the league image and eventually see a 16 team league within a few years. They want to continue to maintain the "recreational" league as a place where women can enjoy friendly competition with their friends well into their 40's and 50's. Information about the league will be placed on the community web site and also in the Hanmer Valley Shopping Centre. 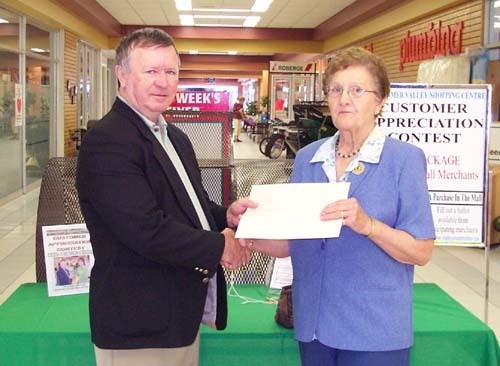 When THERESE CAMPEAU, shown in the photo on the right with Robert Kirwan was presented with the prize package as winner of the May 2006 Customer Appreciation Contest sponsored by merchants of the Hanmer Valley Shopping Centre, she indicated that this was the first thing she had ever won in her life. The proud mother of five has lived a full life during her seventy some years in Hanmer. Therese and her late husband, Rheal, raised five children in Hanmer, and what is amazing is that all five still live in Hanmer and Val Therese. Rheal, unfortunately, passed away on October 16, 2003, after 51 years of marriage to Therese, but his memory is kept alive by his wonderful family, which now includes eight grandchildren and two great-grandchildren. The Campeau family includes: Roger (married to Suzanne); Pauline (married to Gilbert Piquette); Benoit; Rejean (married to Beverly); and Julie (married to Ron Denomme). Julie accompanied her mother to the Shopping Centre to pick up her prize and was just as excited as her mother. "This is great for Mom. She can't wait to go shopping to claim all of her prizes. She never wins anything." 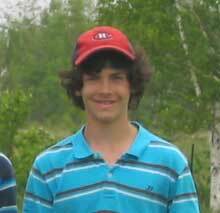 The Annual Junior Golf Tournament sponsored by The Club Optimiste de Vallée was held on May 28, 2006 at the Clearview Golf & Country Club. This was one of the largest fields ever, with a total of 73 boys and girls between the ages of 10 and 18 years taking part. The group in the photo is showing some of their medals and trophies. 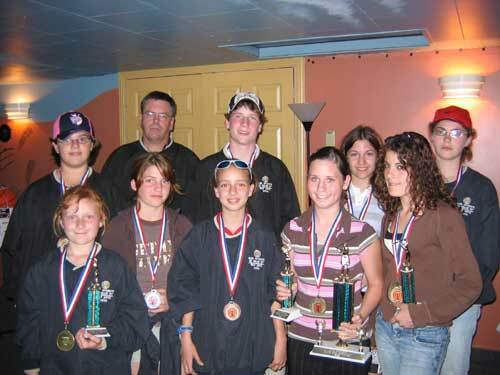 Back row, from the left: Jennifer Beaudry, Rick Legault (President of the Club), Dexton Abresch, Krista Fitzsimmons, and Jessica Belanger. Front row: Natalie Desantis, Melanie Ferron, Michelle Gagnon, Julie Gascon, and Megan Thompson. Membership in the Club Optimiste de Vallee is a bilingual organization that is open to all adults who have an interest in providing healthy recreational and cultural activities for area youth. They meet about six to eight times per year to plan and prepare their annual events and projects. Funding is largely done through a bingo at the Valley Bingo Hall. 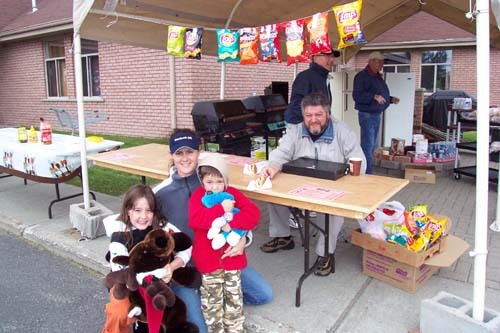 Members are expected to provide volunteer hours during events such as the golf tournament. For example there were no less than 33 volunteers helping out during the golf tournament. Miquel Larocque, shown on the left, is one of four participants who will be advancing to the National Championship Tournament for the Club Optimiste organization. That will be held in Ingersol in August. Others who will be travelling with Miquel include, Dexton Abresch, Megan Thompson, and Eric Cantin. The golf tournament is always considered one of the best around for young people. For example, with the $10 entry fee, participants each could play a full 18 holes; were treated to both lunch and dinner; each received a prize; each received a windbreaker jacket; and had a chance to win a trip to Ingersol to compete for a national title. Besides the Annual Junior Golf Tournament, Club Optimiste de Vallee also runs a bike rodeo, a Christmas Breakfast for a local school; and provides MVP awards to students at local schools. Mrs. Danielle Gagnon, Grade 4/5 teacher at Redwood Acres Public School, is shown with her happy students just before receiving their pizzas for lunch. The Pizza Party was provided by Val and Violet Mazzuca, owners of the Hanmer Valley Shopping Centre in appreciation for the class participation in the Annual Mothers' Day Card Tribute which was held at the mall. The card that was done by the students is being held up in front. A total of 13 different elementary schools from Valley East and Capreol took part in the display. The students were also taking part in Crazy Hair Day. Mrs. Gagnon's class won a School Spirit Award for having 100% participation in the event. Danica Laverne, a 10-year old Grade 5 student attending Valley View Public School, decided to do a historical project on the Mazzuca Family this year. The display can be seen at the Hanmer Valley Shopping Centre where it has been proudly set up by the owners of the mall, Val and Violet Mazzuca. A group of approximately 20 students from Grades 7 through 12 at Marymount Academy are planning an educational trip to Europe during the March Break in the spring of 2007. That means that for the next nine or ten months they will be out trying to raise money to pay for the trip. The Travelling Group took advantage of the heavy traffic in the Hanmer Valley Shopping Centre to hold a Penny Table and Bake Table recently. 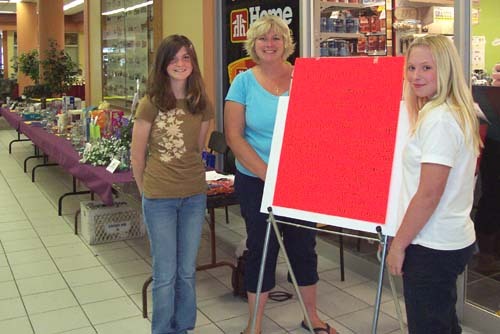 Shown in the photo above, from the left, are: Kayla Ryan, Shandi Charette, and Kaitlyn Charette. Both Kayla and Kaitlyn are in Grade 7 at Marymount. Kaitlyn's mother, Shandi, will be one of the parents accompanying the group on the trip. In the photo below we have Kaitlyn and Kayla with Kayla's grandmother, Helen Ryan and her grandson, five-year old Bradey Ryan. Helen did much of the baking for the table which was a popular feature during the weekend. Many realtors are indicating that they have never seen anything like the current housing boom in the Sudbury region. Homes are being sold the same day they are listed, and it is reminding people of what it was like in the mid-80's. The shortage of listings with the high demand means that prices for houses are rising rapidly. It appears as if consumer confidence in the local economy is fueling the growth. Back in 1999, there were only 131 new housing starts and there was an 11 percent vacancy rate in apartments. That marked the all-time low for housing construction in the area. The number of new housing starts for 2006 are expected to total approximately 400 or more. This is well short of the boom years of 1989 when close to 1000 new homes were built, but with a vacancy rate of only 2 percent, the demand for new homes will continue to increase. 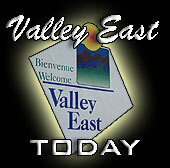 Valley East is benefiting a great deal from this housing development. Many older people from smaller towns in Northeastern Ontario are coming to Sudbury to retire; baby boomers are up-sizing to bigger better houses; others are down-sizing; and the economy, especially the mining sector, seems to be creating employment. After months of negotiations, Greater Sudbury Transit and Laurentian University have signed an agreement which will allow all students unlimited use of the transit system for the eight-month school year. The agreement was signed last week between the city, Laurentian's Students' General Association (SGA) and francophone students' association. Greater Sudbury Mayor David Courtemanche, SGA president Luke Norton, Gabrielle Lemieux, president of the francophone students' association and LU president Judith Woodsworth gathered at Thursday to announce a universal pass or "U Pass" will be available for all LU students this September. A referendum on whether to adopt the universal pass was held during student elections in March. Many students have voiced their concerns about having to pay for the transit pass whether they use it or not, but SGA president, Luke Norton says he doesn't expect any more complaints now that the fee has been reduced to $135 from the original $200. While the pass will be a good thing for students who use the transit system, many students from Valley East and other outlying areas feel that they should not have to pay for the transit pass if they find it more convenient to use their own vehicles. Students who use their vehicles must absorb the cost of paying for the automobile, gas and maintenance, as well as a parking fee of well over $100 to park at the university. The real test will be to see if ridership does in fact increase as a result of the student transit pass. Critics of the plan say that all this is doing is forcing all students to subsidize those who can avail themselves of transit services, particularly those living in the former City of Sudbury where most streets have access to bus routes. Students in outlying areas such as Valley East will still find it inconvenient to use the transit system to get to Laurentian University since they often must walk long distances to catch the bus. Pressure is mounting from local citizens to have pesticides which are used for cosmetic purposes banned in Greater Sudbury because the chemicals are toxic to humans and animals. Over 100 other communities in Canada have already implemented such a ban. Council was presented with a petition sighed by 1,600 citizens who want a bylaw prohibiting the use of pesticides on lawns, gardens, golf courses, commercial property and city property. The ban would not apply to farmers or spraying to combat public health problems like West Nile Virus. A number of high profile medical organizations are actively lobbying for pesticide bans, she says. Councillors, such as Terry Kett, are reluctant to pass such a by-law until there are public meetings and a staff report. It is expected that the by-law is inevitable and will likely be ready for passage by next winter. Sunday, June 18 is Fathers’ Day. This has always been a special day of reflection for me, and often it has been a day when I wish I could have turned back the clock and taken more time to appreciate all that is good about being a father. To illustrate this point, I would like to share a little story that has always been one of my favourites. Two little boys were dressed and ready to go. In fact, they had been ready now for more than an hour. Excitement flooded their faces and all their talk was about only one thing: their father had promised to take them to the circus that afternoon and they were only minutes away from leaving. As planned, Dad came home from work early that day, right after lunch and quickly changed into casual clothing. Then, just as the three of them were about to leave the house, the phone rang. The boys listened intently as their father talked with the person at the other end of the line. Bit by bit, their faces began to fall. This was obviously a business call, and some urgent matter was requiring their father’s attention back at work. Disappointment rolled into the room like a dark cloud. Their mother also overheard what she thought was the inevitable change of plans, and looked consolingly at her sons. She went over and stroked their hair, hugging them closely to her sides. She knew how terribly disappointed they would be when her husband got off the phone. Sometimes it takes a long time for a father to realize this. With young children around the house, there seems to be little time for the really important things to get done. There are always chores to do or things to repair. Work responsibilities often require overtime or a change of holidays. Nevertheless, one must never forget to look at the world through the eyes of a child. Eyes that long for those precious few moments of time spent in play with their father. It doesn’t have to be much. The five minutes it takes to look at your child’s math test; waiting for your child to find his shoes so that he can come with you to the store to pick up some milk and bread; playing catch in the backyard for five minutes; crawling into the ‘cabin’ your child made behind the couch; sitting with your child at the hockey game instead of talking to the other fathers in the corner of the rink; taking twice as long to put out the garbage because you let your child help you carry it to the road. My own children are adults now, so I have gone through the ‘father routine’ for over 31 years. In fact, I have also been into the ‘grandfather routine’ for the past two years. For all my experience, I have two pieces of advice to give to young fathers. First, don’t ever feel that spending time with your children is less important than anything else you have to do in your life. Absolutely nothing is more important than spending time, even if it is just for a few moments with your children. Secondly, never pass up an opportunity to make your children realize that you are extremely proud to be their father. I have held many positions and accepted many responsibilities in my life, but my most important role, by far, is my role as a father. I know that this responsibility will continue for the rest of my life, and for that I am extremely grateful. If you have time to relax for a while, make sure you visit the following web site. It is one of the most amazing web sites I have ever come across.